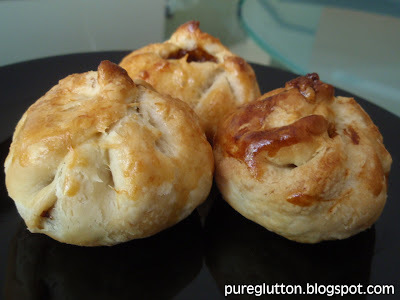 I have always wanted to try making Siew Paus at home but had never really gotten round to doing it. Mostly because I wasn’t very sure on how the “oil” and “water” doughs work and the technique of rolling the pastry. 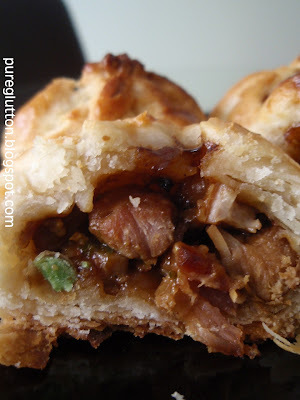 There’s a certain way of doing that which would result in the thin flaky pastry of the Siew Pau. Then I stumbled upon this blog here which had very clear instructions and photos (yayyy!) 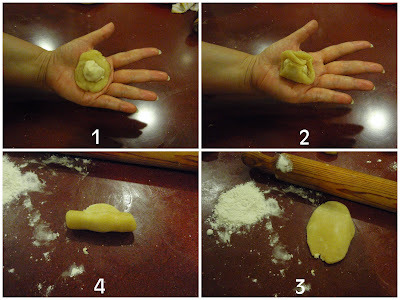 on how to fold and roll the pastry. What a godsend! The first time I tried that recipe I found the dough to be a bit dry and so it was quite a task folding the siew paus & making sure the dough stick together at the top and not have “erupted volcanoes” as a result! So, I tweaked the recipe a bit and the 2nd attempt yielded softer, more pliable dough which turned out very well. 1. Sieve the flours into a bowl. Rub in the oil until the mixture resembles breadcrumbs. 2. Mix the sugar & honey with the water. Pour into flour mixture and knead into a dough. 3. Rest the dough for about 30min. 4. Divide dough into 18 pieces. Just mix the shortening into the flour and rub/knead into a dough. Divide dough into 18 pieces. 5. 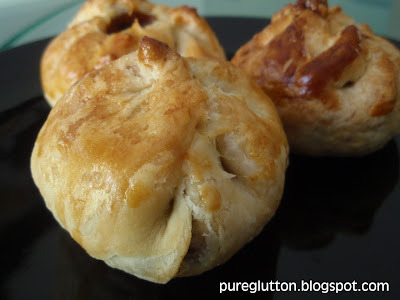 Roll out dough into a circular shape, put in about 2 tbsp filling, fold & pleat the siew pau. 1. Saute chopped garlic & bombay onion. 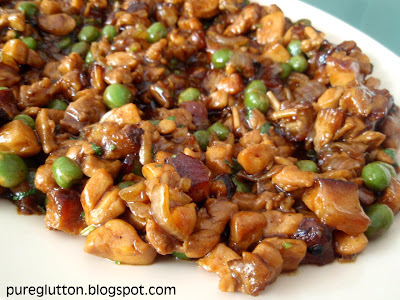 Add in charsiew/chicken/meat and green peas. 2. Add in all the seasonings, sauces and water & let simmer for about 15 minutes. 3. Add in the corn starch to thicken the gravy, chinese wine and chopped parsley. 4. Cool the filling before making the siew pau. 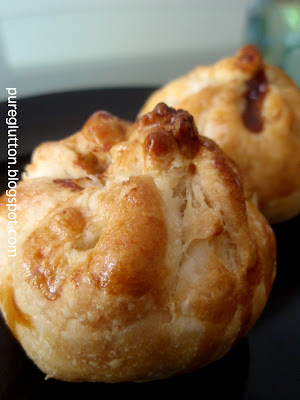 I’m so glad to say that the pastry turned out perfect – flaky and crispy! Do try this at home – it’s really quite easy and not as intimidating as I thought! LL loved this so much – he practically polished off the entire batch and kept asking me to make some more! Can’t blame him because I used charsiew bought from Spring Golden, you know! wow, that's a lot of work!!! good one!!! SimpleGirl: Actually it's quite simple, once you get the hang of it, hehe! The instructions looked complicated only! Sure, I'm sure there will be an opportunity to share this with u! 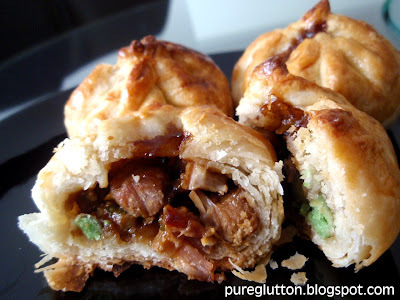 High Q char siew for the Siew Pau? not bad .. not bad. but it sure takes skills to keep them crunchy even when cold huh? i like to order 20 please, bring it wif u to Abu Dhabi..ok! J2Kfm: Yeah, could not get other charsiew that day, so went to Spring Golden, LOL! icook4fun: Thanks for visiting 🙂 Yeah, this is such a comfort food! of course you are invited (unka's party) dear! Hw can u even doubt that! We stil rmbr your hospitality with your yummy NL and etc! I find the rolling & folding a gargantuan task (ehhe,. lazy maa) but will try once I get my kitchen ready..
*cough cough* arent you supposed to reccuperate? hehehe anyway your pleats are fantastic. Kawaii: Thanks for visiting my blog 🙂 Hope u can find some siew paus over there at your place! Leo: Thanks 🙂 Siew pau in exchange with patin fish, hehe?! the fillings are top notch, i think the skin a bit thick.